When it comes to the Hunger Games, staying alive means finding food any way possible. Katniss and Gale hunt live game, Peeta's family survives on the bread they make, and the inhabitants of the Seam work twelve-hour days for a few handfuls of grain - all while the residents of the Capitol gorge themselves on delicacies and desserts to the heart's desire. If you're starving for more from Katniss, Peeta, and Gale, The Unofficial Hunger Games Cookbook is sure to whet your appetite! When my brother was in middle school, he started getting into cooking. Nothing gourmet, but he was pretty damn good. He also loved to read, so this would have been the perfect gift for him. I wish I had found it earlier! 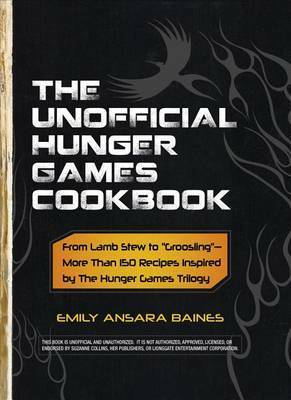 The Unofficial Hunger Games Cookbook is filled to the brim with fairly simple recipes that are based on dishes mentioned throughout the trilogy. Each recipe is prefaced by a note discussing the dish within the context of the series as well as the specific chapter in which it is mentioned and cooking tips from the author. Most of these recipes would require little more than parental supervision for a child who already has basic cooking skills, such as hearty ham and egg tart, trash taters, district 12 drop biscuits. For the more adventurous palate, there are many recipes with more unusual - or, at the very least, less common - ingredients, such as district 4's seaweed bread, father-daughter yucca flower stalks au gratin, pink mashed potatoes with evening primrose roots. Of course, you can't get into the food of The Hunger Games without getting into some very... interesting meat options. Groosling may not exist in the real world, but Katniss does hunt many other types of wild game in the books. There are recipes for several unusual types of meat in this cookbook, such as dove, raccoon, squirrel, beaver, rats, and muskrats. That's not quite to my taste, but I can imagine that my brothers would love to eat disgusting things like that! My husband would too, probably. There's a semi-local restaurant called Camp Ticonderoga that serves a dish called Road Kill Grill made up of venison brochette, wild boar sausage, and semi-boneless broiled quail. You can always tell who's eaten it because they drive around afterward with the signature "I Eat My Road Kill" bumper sticker. There are tons of similar unofficial fan-made cookbooks out there, but this one really takes the cake. It has a great combination of simple and complex recipes that will interest both male and female fans of all ages. To put it simply, there is something in this book for everyone! Waiting on Wednesday is a weekly event hosted by Breaking the Spine spotlighting upcoming releases that we are eagerly anticipating! Today's selections will release on May 19, 2015. In Erin's Kiss by Lora Leigh, ex-Marine Turk has become Erin's sworn protector. The consistent target of her CIA-operative brother's deadly foes, Turk is the only port Erin has to cling to in a storm. He promised her brother long ago never to touch her - but how can he resist a woman who aches to be with him as much as he burns for her? In Burn for Me by Shiloh Walker, Tate longs to spend his nights with Ali, a woman he's loved for years. But while Ali's heart pines to be with Tate, her head has reservations. Ali knows that Tate has never forgiven his father for the fight he had with his mother right before she left the house - and was never heard from again. Tate's unresolved anger is a force to be reckoned with . . . but the heat that blazes between them is undeniable. Now both Tate and Ali are left to wonder: Can love really conquer all? In Tangled by Kate Douglas, Nate shows up to work at Tangled Vineyards ready to do all the things he loves best - work with his hands, grow the grapes, and craft award-winning, full-bodied wines. But when something better comes along in the form of Cassie, the winemaker and former owner of the vineyard, Nate becomes completely love-drunk. Getting involved with Tangled's number-one mixologist is a bad way to start off a new job, but with Cassie as a constant temptation, Nate doesn't stand a chance . . .
Also releasing this week . . .